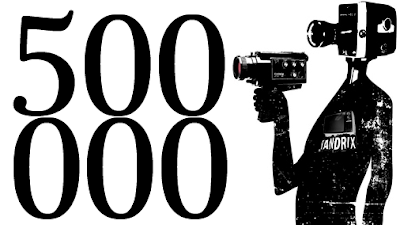 Late last night (after 33 months, several hundred uploads, and keeping a close eye on the numbers all week) my combined online video views from YouTube, Yobi.tv, and Vimeo surpassed the 500,000 mark! That's half a million to those of you not familiar with written numbers - and even to those of you who are for that matter. In many ways it's tough to even find the energy to celebrate the milestone knowing how much effort it took, and continues to take, just to get people to tune in. I've often thought about how uploading a Family Guy episode would be an easier way at getting people to visit my channel - pointless, but easier. One million views . . . now there's something to celebrate. I best get to it then . . .